Tell more effective visual stories by learning the "grammar" of cinematic language with this elegant, accessible reference. 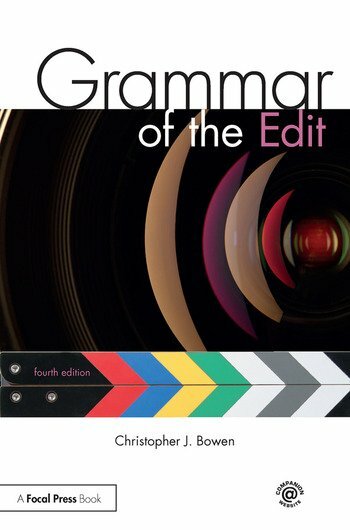 The fourth edition of Grammar of the Edit gives you the answers to the all-important questions of when to cut and why, and teaches readers the principles behind transitions, editing for continuity, selecting the best shots, editing sound, color correction, and more. Designed as an easy-to-use guide, Grammar of the Edit presents each topic succinctly with clear photographs and diagrams illustrating key concepts, practical exercises and quiz questions, and is a staple of any filmmaker’s library. An expanded companion website offering downloadable and editable raw footage so that students can practice the techniques described in the book, and instructional videos showcasing examples of different editing choices and types of shot transitions. New and expanded quiz questions and practical exercises at the end of each chapter help test readers on their knowledge using real-world scenarios. Updated topic discussions, explanations, illustrations and visual examples. An all-new chapter on Sound resources in filmmaking and Audio Editing guidelines. Together with its companion volume, Grammar of the Shot, the core concepts discussed in these books offer concise and practical resources for both experienced and aspiring filmmakers. What Basic Factors May Affect Your Editing Choices? Chapter Four Summation - So How Does All of This Help You? What Factors Lead to Making an Edit? Chapter Five Summation - Is There a Right or Wrong Reason for a Cut? Chapter Six Summation - Does Everything Always Apply? Christopher J. Bowen has worked within the motion media industries for over 18 years as a cinematographer, editor, director, and educator. Currently, he is an Associate Professor of film production and visual media writing at Framingham State University. Professor Bowen is also an Avid Certified Instructor, Creative Director of his own media production company, Fellsway Creatives, and author of the companion text, Grammar of the Shot.